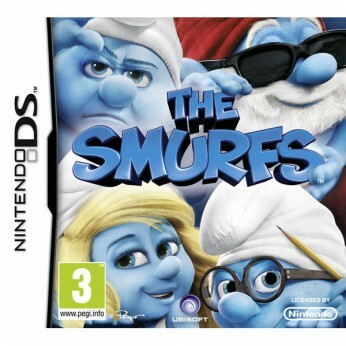 In the Smurfs you get to play a series of fun mini-games and read-along stories about the Smurfs as they prepare for the Blue Moon festival in their village and are disrupted by Gargamel.Available on Wii and DS…. In the Smurfs you get to play a series of fun mini-games and read-along stories about the Smurfs as they prepare for the Blue Moon festival in their village and are disrupted by Gargamel Suitable for the Nintendo DS. Play fun mini-games including cake decoration, Smurf symphony, find the Smurf and Smurfettes dress up! Collect figurines of your favourite characters! Earn a figurine after you’ve overcome the challenges in each mini-game. Read along stories by interacting with the story and selecting different items in the game to change the outcome of the story. For ages 3 years and over; EAN/MPN/UPC/ISBN: 3307219949098. This toy costs approximately £14.99 (for the latest and best prices make sure you check our retailer list for the The Smurfs DS above). In our review of The Smurfs DS we classed it as being suitable for ages 4 years, 5 years, 6 years, 7 years, 8 years, 9 years but recommend you check the manufacturer specific advice before purchasing.